Ford announced Friday it has added 141 new components to its Collision Parts Truckload Program, and they’ll average about 15 percent less than the old list price. Model years weren’t specified Friday, but the company said the parts apply to the F-series, Focus, Fusion, Explorer and Mustang. The added and discounted parts include 44 grilles, grills outer reinforcements or grille outer panels, 42 lights, 12 mirrors, 10 wheels, eight fascias, seven bumper bars, six step pads, five brackets, three steel bumpers and an isolator. 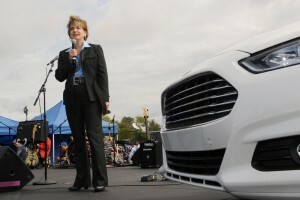 This summer, Mitchell industry relations Vice President noted that the most frequently damaged collision parts in general (not just Ford models) were bumper covers (68 percent of claims), fenders (37 percent), headlamps (29 percent), bumper absorbers (29 percent), quarter panels (28 percent) and door shells (28 percent). However, the most frequently replaced parts were headlamps (95 percent), bumper absorbers (91 percent), grilles (88 percent), bumper reinforcements (86 percent) and bumper covers (72 percent). Horn stressed then that body technicians should make sure they’re properly trained on bumper covers, as “the accuracy of the repair versus replace decision is critical” given their high crash involvement. He also noted that hoods and bumper reinforcements shifting to lighter, nonmalleable metals, those parts will begin to cost more to replace. Though mirrors made up a chunk of the collision parts announced today by Ford, they aren’t among the most damaged parts registered in insurance claims — but that’s misleading, according to Horn and CCC industry analyst Susanna Gotsch. Such mirror damage is often unreported because it’s under the deductible or uncounted because the mirrors are part of a recycled door assembly. If the number of non-total loss collisions was really more like about 18-19 million, she wrote, 800,000 mirrors could be in play. The move comes about a month after Overall Parts Solutions announced shops would be be able to see the low “conquest” price for a Ford collision part early next year in OPSTRAX and shortly after General Motors announced dynamic MyPriceLink list prices would begin to flow through estimating services nationally starting Dec. 1.